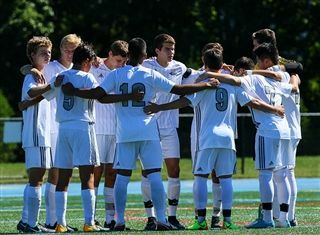 The boys' soccer team has been ranked third in the Skyland Conference and ninth among Non-Public schools after two weeks of play. The Knights opened up their season with a hard-fought 1-1 double overtime draw against North Hunterdon. They followed with a 2-0 loss to Pingry, ranked 15th in the state, and then recorded their first win of the season by topping Ridge 5-0.